Guaranteed. And the year after it will be higher again. As will be the number of congregations that use so-called social media avenues like YouTube, Twitter, Flickr and Facebook. Just a handful use these now. Similarly, the number of congregations that allow web surfers to listen to sermons online will also rise steadily from the current 12 percent. It seems we Mennonites—like so many around us—are asking how can we make Internet-based technology work for us. Beyond Mennonite Church Canada are examples of churches that are even more technologically inclined. The Meeting House—a Brethren in Christ mega-church in Ontario—has three staff devoted to technological aspects of its ministry. That ministry involves recording services at a “central production site,” then re-broadcasting those services in theatres at eight locations across the province. Congregants at the original service can send questions to the preacher via text message while he’s speaking. Some get responses as part of the service; the rest get an e-mail later. Even further out into cyberspace, the good Reverend Google will gladly welcome you to Cyber-Church.com, sing with you at CyberHymnal.org, or pray with you at CyberPrayerWall.com. How does web-based technology enhance or alter our Mennonite identity? How does it build or erode community? Does it widen or narrow the generation gap? Do less wealthy congregations end up at a disadvantage? Arthur Paul Boers laments the lack of consideration given to the implications of technological change. A former Mennonite pastor, he is currently a professor at Tyndale Seminary, Toronto, Ont., and probably the leading Anabaptist thinker on questions of faith and current technology. Boers’ upcoming book, Focused Living in an Era of Distraction, will consider how current communication technology shapes us as individuals and communities. He told me he is not calling for the abolition of technology—he’s no stranger to the Internet, as you’ll see if you look him up online—but simply for a careful consideration of “how our engagement with technology forms us.” For him, the baseline question is, “What really is church?” Is church primarily about delivery of content, maximizing exchange of information, entertainment, accommodating the online generation, or “incarnational relationships,” to use his term? To get at these larger questions, it’s worth first considering the extent and nature of the Mennonite presence online. The 116 MC Canada church websites I visited range from slick to amateurish. Most are designed both to attract newcomers and inform members. A typical site includes service times, a map, upcoming events, profiles of pastors, an explanation of beliefs, contact information, and links to organizations ranging from Christian Peacemaker Teams to Focus on the Family. The snazzier sites might also have bulletins, photo galleries, pastoral blogs, and sections with titles like “What is a Mennonite?”, “What to expect?” or “Why church?” Many sites also have “members” sections for which a password is required (although I expect these sections will dwindle as churches realize that having these closed doors on websites appears uninviting and insider-ish to the public). The majority of the sites I visited look like they were developed some time ago and receive minimal maintenance. This is understandable given the fact that the cost to develop a decent site is between $2,000 and $3,000, and could be much more. And it takes time to keep a site current. The Level Ground staff spend up to five hours a week working on its site. The money and effort show. Some sites immediately make you want to spend time looking around; others don’t. While it’s hard to get a clear picture of how much the 116 church websites are used, and by whom, Dan Loewen—Level Ground’s worship and creative arts pastor—says its site averages more than 700 visits per month and online sermons are listened to by up to 20 people, depending on the sermon. The sermons posted on Zurich (Ont.) 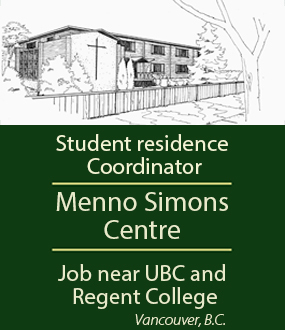 Mennonite Church’s top-notch site, kingsfieldcommon.ca, are listened to by between 30 and 100 people per month. Given that these are two of the better sites, many church sites presumably receive nominal traffic. The conference also has its own site, which features, among other things, the monthly Church Matters podcast. According to Dan Dyck, MC Canada’s director of communications, these online programs—which are similar to the conference’s radio programs—have been listened to a total of almost 4,600 times since they began in 2007. That compares to about 20,000 people who tune in for each Sunday morning radio program, which is broadcast only in southern Manitoba. But neither podcasts nor radio broadcasts are for everyone. Dyck says one of the biggest challenges is that some people prefer texting, while others use standard e-mail, Facebook or none of the above. It’s difficult to re-package content to cater to each preference. So the national conference is testing the techno waters in a few ways. In addition to the podcasts, it has a Facebook presence and a YouTube channel. The YouTube channel has short videos that explain what Mennonites are. These include light-hearted explanations of what we eat and drive. Dyck says part of the intent is to counteract the prevailing disinformation about Mennonites on YouTube. For instance, search for “Mennonites” on YouTube and the list is topped by “Cornie the Mennonite,” a minor YouTube sensation whose sometimes off-colour parodies of southern Manitoba Mennonites have been viewed more than 200,000 times—about 10 times more than MC Canada’s videos. Among Mennonite organizations, the Mennonite Central Committee (MCC) website is probably the most used, with an impressive 40,000-plus visits per month, including about 15,000 visits from Canadians. Even The Meeting House is far behind, with 6,000 monthly visits. MCC’s thorough and user-friendly site is loaded with current and ever-changing content, ranging from updates on MCC involvement in current crises and photo galleries, to resources for engaging children and a donation section (almost 11,000 people donated to MCC’s Haiti relief online). Like MC Canada, the challenge for MCC is “deciding which web-based technology to embrace . . . because of the amount of time and energy they often demand,” says Rick Fast, who heads MCC Canada’s communications department. The decisions are complicated by the fact that these technologies can be “here today and gone tomorrow,” he notes. Can the web hold us together? Overall, it would probably be accurate to say that, when it comes to the technology race, we Mennonites are trying fairly hard, although still lagging behind despite a few exceptions. But that doesn’t answer the deeper questions about what Internet technologies are doing to the character of the church. First, consider the generational issue. While I expect that the mere mention of social media intimidates and distances a certain percentage of Mennonites, the people I spoke with did not express concern about older Mennonites being left in the dark. Some churches with older populations simply don’t rely on technology. Others manage to keep the older members in the loop even if most of the congregation is online. 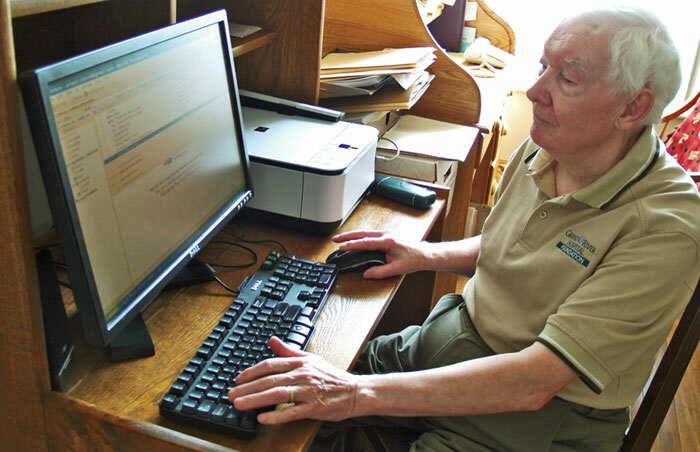 Waterloo North Mennonite Church makes use of e-mail for communication among members, but 76-year-old Ralph Lebold, who hauled his old computer to the dump more than a decade ago, doesn’t feel left out of the loop. “I usually find out what’s going on,” he says. And both MCC and the national conference remain committed to print communication in order to ensure no one gets left behind. That is always a danger with technology: that some will get excluded. Technology costs money and that means that bigger players are able to adopt it sooner, and increase their advantage over others. Technology, by nature, tends to increase the gap between rich and poor. So we could ask whether people who cannot afford a computer feel fully included in our churches? And we could ask whether technology results in larger churches out-competing smaller ones for members. Boers says that when he was a pastor he found the pressure to compete with the better-equipped churches “demoralizing.” Dyck has heard angst from pastors who feel they need to compete with The Meeting House. The Internet can connect us—at least some of us—in certain ways, but, as Dyck says, ultimately, “community happens best face to face.” Boers believes online communication makes most sense in the context of existing, in-the-flesh relationships, but is generally ill-suited to communication of things like prayer requests. He tells of a case in which a switch to e-mail communication of prayer concerns displaced valuable personal communication that had taken place previously within a church community. Use of web-based technologies also raises questions about community on an international level. The tech sector, like most industries, has a dark side. The environmental and social hazards of so-called e-waste are well-documented. As are the deadly impacts of the wars to control access to tech-related minerals in eastern Congo (just type “coltan” in the search box at mcc.org). We can use the Internet to promote peace and justice, but we might be indirectly putting money into the pockets of some of the worst warmongers in the world when we buy our peace-promoting techno-gadgets. That doesn’t necessarily mean we should make a collective trip to the dump, but it does mean that we need to look at both sides of the tech equation. While the flitting-about mode of being is commonplace for so many these days, it is contrary to the contemplative spiritual tradition—in which Boers is steeped—which values being present to the moment and aware of God’s presence in every moment. Boers believes we should be aware of the hazards of the Internet, discerning in our use of it, and willing to accept some limits. He does not say we should abandon it. Indeed, web-based communication is here to stay. And there is an air of inevitability about the church’s continued march into cyberspace. Even Ralph Lebold, the self-confessed “converted Luddite,” has gotten a computer again. And tiny Emmaus Mennonite Church, Wymark, Sask., with its 35 members—if the MC Saskatchewan website is up to date—has its sights set on cyberspace. I thought pastor Ray Friesen would tell me that in such a small, tight-knit community Internet communication was not necessary, but he says the congregation is looking to get a site and post sermons online. As we proceed then, we must ask good questions. And ultimately we must ask, “What really is church? Who are we to be? How can we best incarnate God’s love? How can web-based technologies facilitate this, and when do we need to get up from the computer, roll up our sleeves and live out that simple, practical, caring faith of our pre-Internet Anabaptist forebears? Will Braun is a dad, gardener and writer who attends Hope Mennonite Church, Winnipeg, Man. 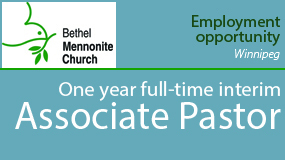 (hopemennonite.ca). He can be reached at wbraun@inbox.com or, even better, in-person at 204-772-7280. 1. What types of web-based technology does your congregation use? In your experience, how has the Internet benefited your church? Are there ways in which it has harmed the sense of community? 2. Will Braun quotes Ralph Lebold as saying that “the heart of the life of the church” is in “the quality of relationships.” If this is true, how important is web-based technology for churches? Would you feel comfortable receiving pastoral care via Facebook? Does the use of technology change who we are? 3. How much time and money should churches invest in Internet technology? Is it worth the cost to try to stay up to date? Is it more important for Mennonite institutions than for congregations to have the latest technology? 4. Does Internet-based technology control us, or do we control it? What would Jesus do with web technology?